This newsletter is specifically related to the ExplorOz Traveller app. Keeping reading for our latest news and stacks of useful tips that will help you get the most from the app. build & save your Private Treks whilst you have an internet connection to allow the auto-guidance system to build routes along road lines. Once you save your route, you can reopen when offline, exactly as it was created. here's how to navigate from A to B: Locate (or create) a Place on the map near your desired start point and click Go To - this will launch the navigation control panel and add your start point. Click the cross to close the panel to view the map again (or just click the map behind it) and find the next Place along your route and click Go To - you will be prompted to ADD or INSERT this destination so accept one of those choices and continue adding Places to your nav plan in this way. The autorouter will give you the quickest route so if you have a preference to go another way, insert an extra Place. Do this with an internet connection and you'll get accurate distance and travel times. You can also select different modes of travel to allow for cycling, and walking too. navigate to an address click Places List then click "Address" option shown at bottom right of screen. Type in an address, select it and click Go To. The app will keep this in your nav plan unless you press clear nav plan, delete (allows you to delete a selected Place from the nav plan), or navigation (starts the auto-guidance system from your current position). if you want family/friend's to see your live Member tracking go to your MyTracking tab on the website. You should have a device listed - click on this box and look for the heading "Direct Link" and copy/paste this link to give your friends/family. This link will always show them tracking for that device. Note: if you have a Security Key you will also need to provide them with the password (you can view/change the Security Key password from the Edit Account section in your Profile from the website). to avoid messy track logging use the Save/Archive or Clear buttons periodically (located on the website - on your profile page in the MyTracking section). We recommend this at end of every trip or trip segment. to know whether your tracking is syncing take note of the number of positions and last sync date/time. This is shown on the home screen. After a sync the positions will reset to 0. If tracking is being stored on the device the positions will have a number that gets larger as you move. your current position coordinates are shown on the app home screen - in an emergency this is always there so you can relay your exact position details over radio/phone - no requirement to be online. For more help and instructions remember to read the on-board Help/Instructions from within the app (see black buttons at bottom of Home Screen). This is our final reminder that we're running a competition just for app users like you. But unlike most "photo competitions" we're looking for QUANTITY not necessarily quality. But with only 13 days to go, you better be quick! 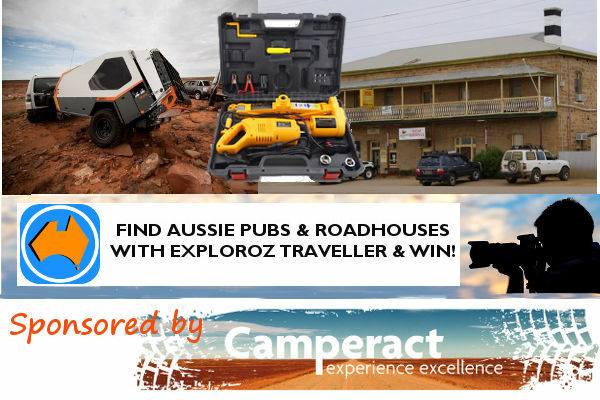 The winner of this competition is simply the person who uses the photo capture button in the ExplorOz Traveller app to add the most photos to places before 10th December. But not just any Place - we're looking for PUBS and ROADHOUSES! TOO EASY! Go to Newsletter Edition 3 for full entry details and see the great prizes on offer! Did you know that we have a series of video help tutorials for the ExplorOz Traveller app? You can find these on the ExplorOz YouTube Channel. Why not subscribe to receive notifications when we load new tutorials. Please use the Traveller email account: traveller@exploroz.com or post on the ExplorOz Traveller Facebook Group.